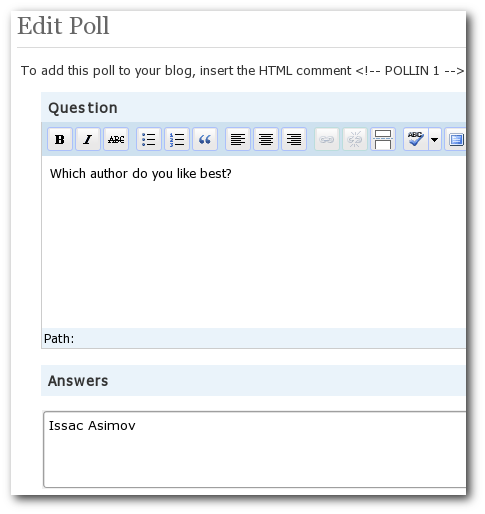 Pollin wordpress plugin will let you add polls to your blog. It can be shown to your visitors who will be able to vote in the poll. You can add the poll in a post by including the html comment [POLLIN 1] in the post. Here 1 is the ID of the poll to be shown. Note 1: Pollin is a beta plugin(as are most of the plugins released in the Plugin Week) – so watch out for bugs. And trust me, there will be a lot of them. 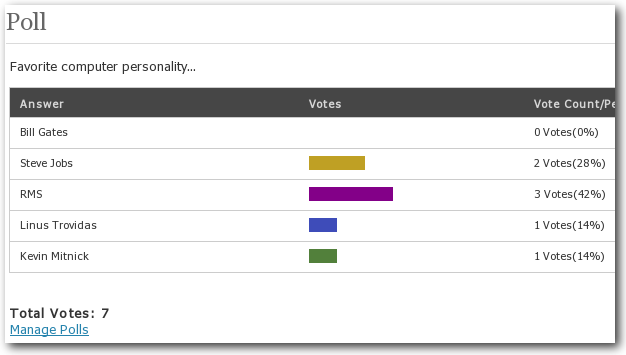 Download the zipped file from the Pollin page in WordPress Plugin Repository. Go to the Polls Management page(Tools > Manage Poll) to create or edit Polls. If you have any suggestions or notice any problems with the plugin, post it in the Pollin forum. Keep your eyes peeled for the next plugin – to be released tomorrow. sounds good 🙂 can we add links and images, in questions ? You can add images in the question easily – it has a WYSIWYG editor. You can do it in the answer too – but that just has a textarea – so you have to type in the HTML to do that. great plugin dude…..but I would like to see ajax implemented in the next realease of this plugin…..
great plugin. agree with Roshan.But got problem after install it. Preview in summary post show this……. But it’s it work ok on full post. Hello Binny, how are you? Well, I’d like to know if it’s possible to put your plugin – Pollin – on the sidebar, or just work on the content? thanks! in your template file – that should show the poll at that location. POLL_ID should be replaced by the ID of the poll that you want to insert. Thanks a lot my friend… I’ll try to use this code… thanks again! see you! When I tried to make new poll, it wouldn’t be saved. On my servers running MySQL 5 there aren’t problems. This is a known issue – MySQL 4 don’t have sub query support – which MySQL 5 has. That’s why this error shows up in MySQL 4. You should give a note in description that it can’t be used on MySQL 4. I found another bug in this plugin that is visible on working installation. If there are quotation marks ( ‘ or ” ) in either question or answers, they are replaced with \’ and \” respectively, so it’s impossible to use any HTML code (which you said as possible) nor quotation marks in normal situation. I think that you should fix this. And you should call jQuery using wp_enqueue, not directly. Thanks for tips – I’ll fix the issue in the next version. Great! I have one more suggestion for future releases. It would be good to have options to reset or manually edit number of votes. Why this is needed? Lets say that author of poll have been testing how does poll works and since he needed to vote, his vote is counted too. And he maybe voted several times and that can affect polling. Thats why after he finish testing he simply reset (if he tested on begging) or manually edit (if voting already started). Also, some commentators asked for AJAX results. I am against it since all other poll plugins use AJAX and this is only one that is different and I think that it should stay like that. Another option would be to user choose if they want AJAX or classic look. In Pollin when you use a word like don’t. It comes out don/t. If you could fix it that would be great. Thanks. Great! I installed this and when i go ‘manage polls’ even though i have created 2 polls nothing shows in the list for me to edit etc. If i add the HTML code in my posts all i get is the question and a vote button and nothing else. Better still i deactivated the plug in and then reinstalled it to see if that was the issue and even though i have deleted it and deleted the folder in the wordpress folder structure, when i do a clean re-install the questions i had added before still show up if i add the HTML code in my posts. So basically if i delete this plugin it still holds the data for the polls which it should not do. Not impressed i have to say and i would like to know how to wipe this question data off my wordpress please when i have deleted the plugin as i do not want any clutter i do not need. If you delete it should delete EVERYTHING but it does not. You’ll have to delete the tables manually using phpMyAdmin. Sorry about that – there is no other choice. Doesn’t work this nice plugin with php5 and WordPress 2.8.3 ? After the installation i take a question and answers for the poll but after saving there is only “No questions found.” and no poll or poll-id. Sounds like a bug. I’ll look into this. Thanks for reporting it. If this is the issue, how to fix? I’ve got the same problem with no questions shown after I’ve saved them. I work with WordPress 2.6.5. Have you already found a solution to this bug? Thanks in advance! Hello, i recently download this plugin but it doesnt work… When im trying to add new poll a confirmation message apear “Question added” but theres is nothing to show…. I installed it and had problems with the answer database not being created. So, I found the create statements and modified them so they are two separate commands and the problem went away. The big issue is that if they refresh the page with the poll, they vote again. I tried to install the pole plugin, but it does not work. I am using the lastest wordpress. Rich i have the same problem….tell me if you found any solution for it.